I booked a cheap flight to Kota Kinabalu, Malaysia via Cebu Pacific Air for December 28-30, 2011. This is my Christmas vacation getaway I planned with my mom, cousin and aunt. We arrived at the airport around six in the evening and we took a taxi from there to the hotel. After changing a small amount of USD to MYR, we bought a taxi coupon at the arrival desk of the airport for 30MYR and presented it to the taxi driver. I booked a Studio Suite at Gaya Centre Hotel. The room is good for 4 persons and includes free breakfast. The Studio Suite is big enough for all of us. The beds were nice as well the furnishings and other amenities. 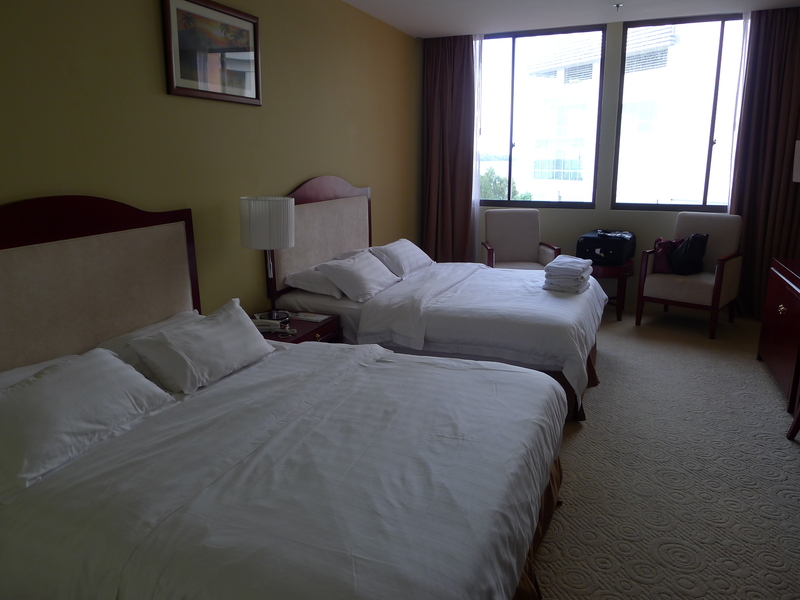 I can say we booked a good hotel for the price of 163 USD for 2 nights. Since we arrived late, there was really nothing much to do after checking. After settling down in our room, we went to Suria Sabah Mall just across our hotel to change money and eat dinner. We ate at Secret Recipe. I know there’s Secret Recipe in the Philippines, but I just have to try it Malaysia just to see the difference of hometown taste. This is what I ordered. Good thing the mall closes at 10pm. We still have time to stroll around until closing. I think Suriah Sabah is one of the biggest malls in KK. It has specialty shops like Coach, Mango, Elle, Cotton On, Hush Puppies, Holika Holika, Elianto and many more. My aunt really enjoyed shopping here…and I mean REALLY enjoyed it. The sale items are cheaper compared in the Philippines and some items are even sold 70% off! I even took home a few shopped items myself. And thus, it’s the end of day 1. So the next day was also another laid back day for the four of us. Even though everyone woke up early, we just spent watching television and drinking coffee while taking turns in the bathroom. We didn’t book any tours for our trip so everything is just on our own. We had breakfast on the 4th floor of the hotel. 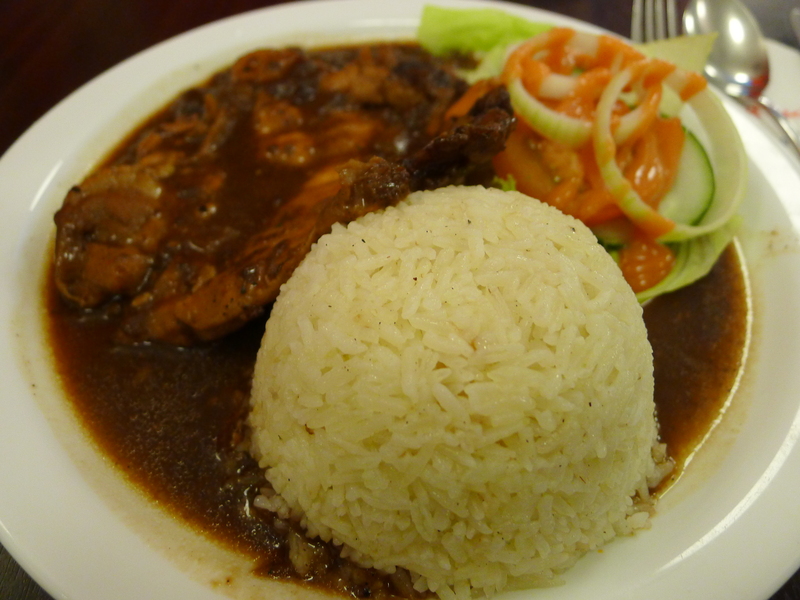 The cafe was nice and offered good food of Western and Malay cuisine. We decided to eat outside overlooking the seaview. 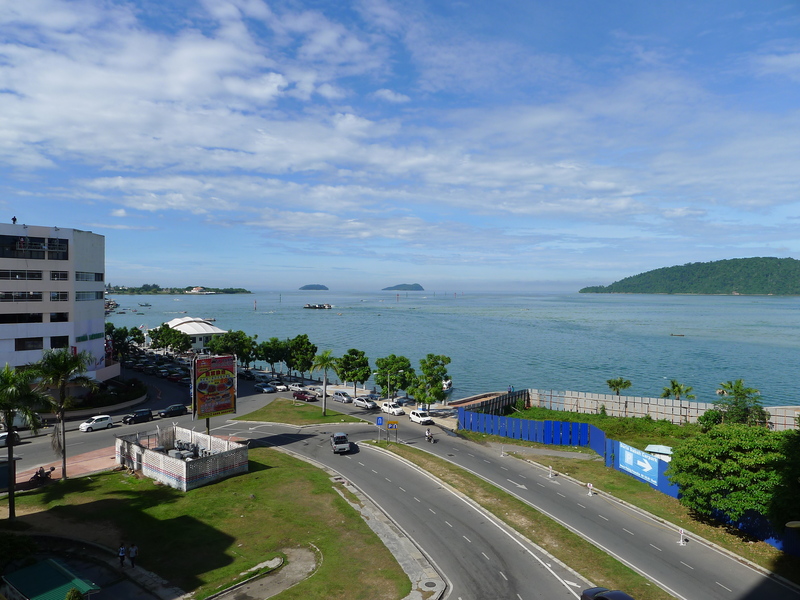 The weather in KK is just like in the Philippines so you can imagine the feeling of having breakfast in an open area at around 9am. After eating, we took photos on the balcony of the cafe. 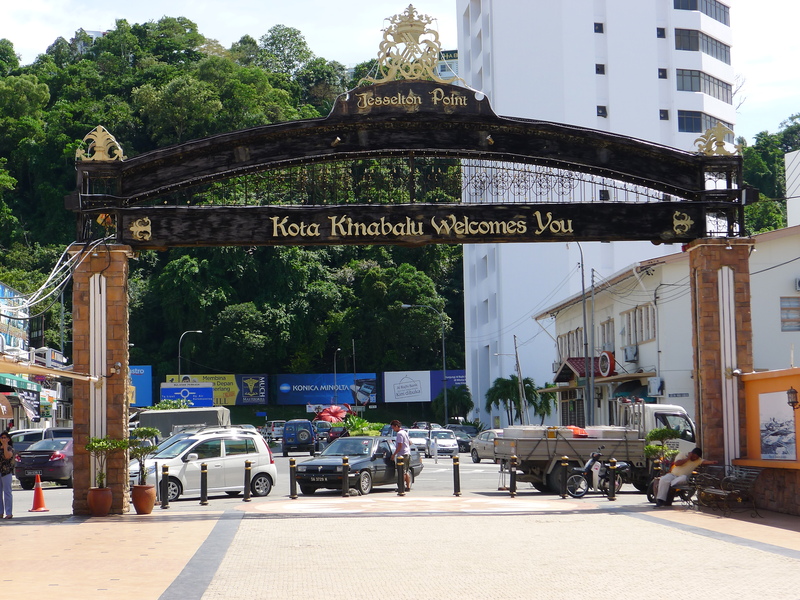 We then went straight back to our hotel room, and thereafter went to Jesselton Point. 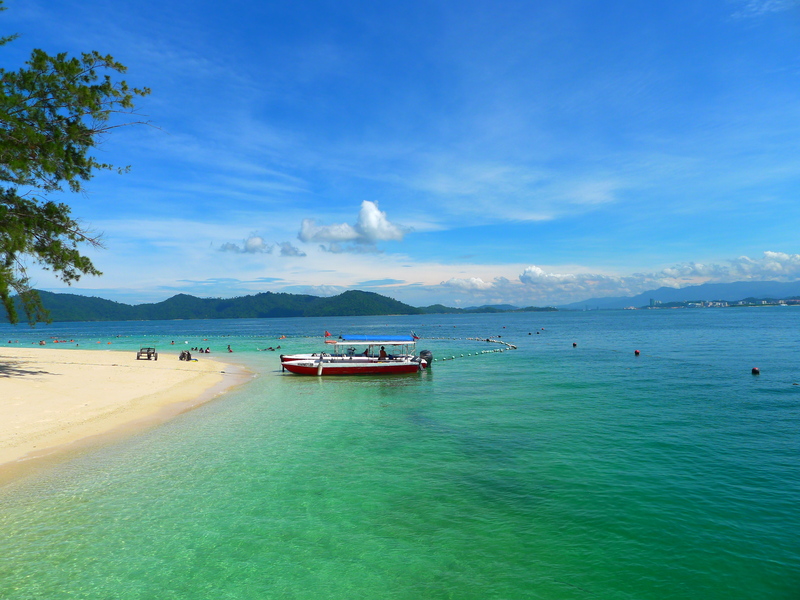 From there, we booked a boat ride to take us to the Manukan Island, Mamutik Island, Sapi Island and the floating houses of the Filipino community. The beach was so beautiful. So after the island hopping, we went to the Filipino Market for souvenirs. My mom bought batik while my cousin and aunt bought pearls. I was surprised that the prices of pearls there were more expensive compared to Manila. Nevertheless, you can haggle for a lower price…and sometimes the seller gives a cheaper price for Filipino buyers. After the spa, we went back to the hotel and got a nice sleep. My mom and aunt went to the night market while we were out. They bought coffee and batik. Thus, day 2 has ended. We did not plan anything on our last day. We just ate breakfast and stayed at our hotel until check out. Since our flight was later in the evening, we still did some last minute shopping. Afterwards, we went to the airport and waited for our flight. So that’s about the whole duration of our trip. We didn’t explore much of the place but still made the most out of our vacation. We really just wanted to have a laid back lifestyle for a few days and not the tour-tour type of vacation.